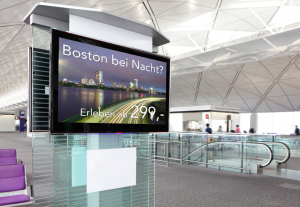 With digital signage you are able to display (audio) visual media elegantly to your customers. The combination of hardware and software allows you to present your products and services in a modern format. Our digital signage solution allows any location to present your products and services stylishly. As a specialist in digital signage solutions and manufacturer of digital signage software, we are your partner for planning, equipping and operation of digital signage display systems. As a retailer we offer a comprehensive portfolio of high-quality information terminals, advertising pillars, projectors, kiosks, etc. in an uncompromising quality and attractive design with an excellent price / performance ratio. Pull all the attention to you: with digital signage displays of Intellispot® TV you are able to do screen advertising for your products and services directly at the point of sale. With well-placed digital signage you show that you have style and know what your customers will love. Be your own designer: create custom content in the form of high-quality presentations with our digital signage software and manage them worldwide. All you need is an internet connection. After saving the contents, the digital signage and advertising screen is automatically updated. Save time and money with our web-based digital signage software because with our solution, you no longer need to print and placard, but can present fast and flexible content on digital displays thanks to Intellispot® TV. For more information please contact us at your convenience.